Scenario: Brand new Dell M610 blades. Connected to the network with a 10GE uplink into a Dell PowerConnect M6220 blade switch. 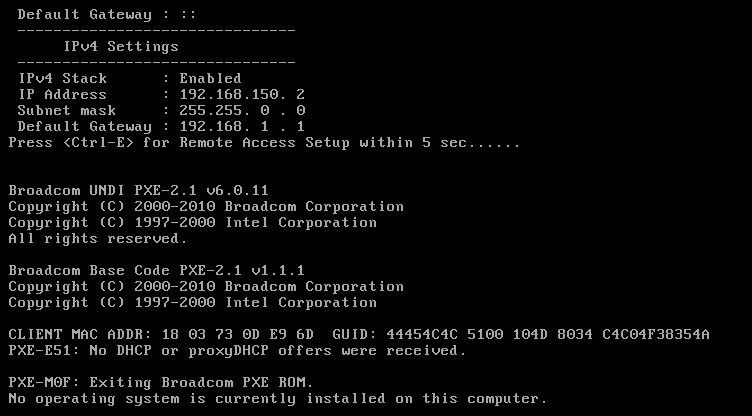 DHCP server evidently working, as everything else boots / gets addresses fine. Can't seem to get a DHCP address from the server. Is there something on a blade chassis level interfering? Will I need to set up something special on the chassis? On the switch? On the blade? It sounds like you might have an L3 switch in the mix that needs DHCP Forwarding configured on it. MDMarra was closest with the suggestion of a L3 switch. Resetting the switch to factory defaults. Double-checking the cables to the fibre core switch and the patch panel. Swapping the SFP port on the Dell Blade Switch (Why this matters is beyond me, unless there's a duff port). Testing everything one more time. Maybe you haven't enable portfast, or the Dell equivalent on the switch? Not the answer you're looking for? Browse other questions tagged dhcp pxe-boot blade-server blade-chassis or ask your own question. What would cause a PBX or SIP phone to not register on the network when using Netgear Switches? How to debug failed Ubuntu 15.04 PXE install on Dell R710? Validating DHCP Rebroadcast by Router?